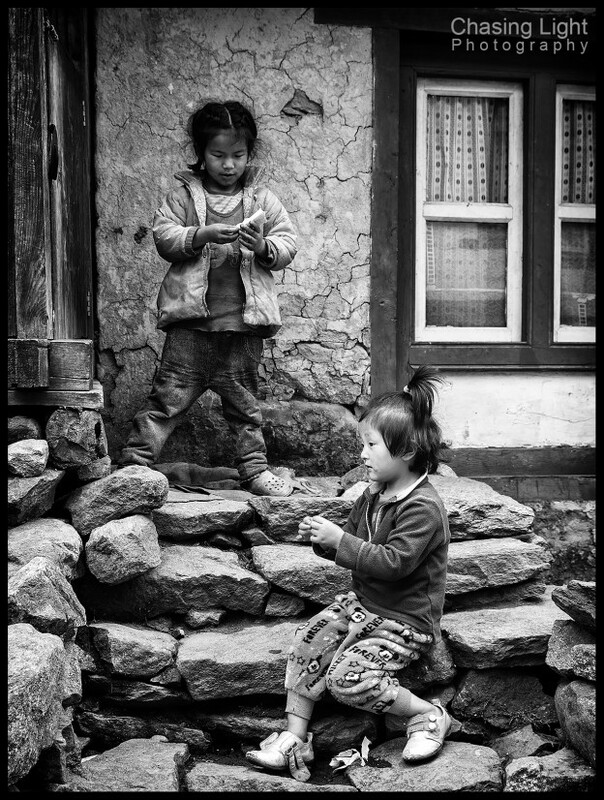 This entry was posted in Photography, Tips & Techniques, travel on September 10, 2014 by Michael Weeks. This entry was posted in Photography, Tips & Techniques, travel on November 18, 2013 by Michael Weeks. Leafcutter ants are amazing creatures that are found in Costa Rica and other parts of Central America. They harvest leaves from various trees and return the leaves to their mound to process and subsequently serve as food for the community. When you find one, you find many, typically in a row carrying their leaves home. 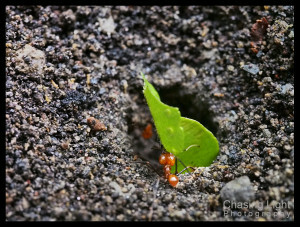 In the picture above, a leafcutter ant returns home with his harvest. This picture was taken in the Arenal Volcano National Park in Costa Rica. The photo was hand held with the amazing Olympus 60mm macro lens. 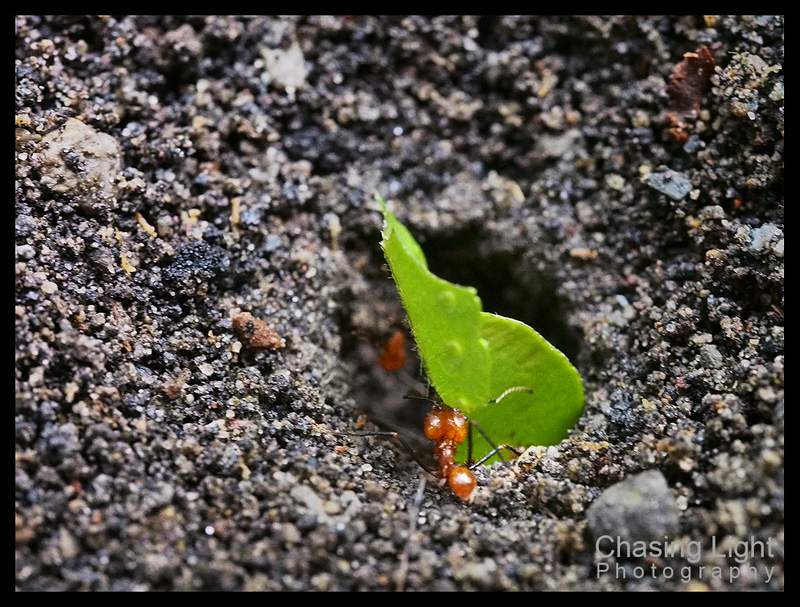 I’d love to return to Costa Rica to capture more images of these ants. This entry was posted in Photography, Tips & Techniques, travel on August 21, 2013 by Michael Weeks. I just returned from 8 days in Costa Rica. It was my first trip to this Central American country. The area is beautiful, with a wide variety of flora and fauna. The country also has almost everything you could want in landscape variety, mountains, beach, and everything in between. Although this was primarily a family vacation, I always have my camera with me. 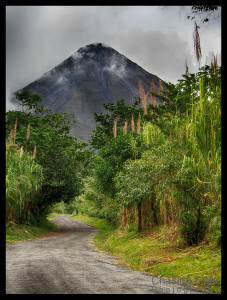 The Arenal Volcano was one of the highlights of the trip. The volcano was dormant for hundreds of years when it erupted unexpectedly in 1968. Apparently, few people realized it was a volcano until then, despite its classical conical shape. The volcano has remained active since 1968, although the activity has decreased since 2010. This volcano is frequently shrouded in clouds, so I felt lucky to get this shot between rain storms. This entry was posted in Photography, travel on August 9, 2013 by Michael Weeks. I’ve finally replaced my aging iMac with a shiny new iMac. The 6-year old computer was grinding to a standstill on photo intensive tasks like HDR. 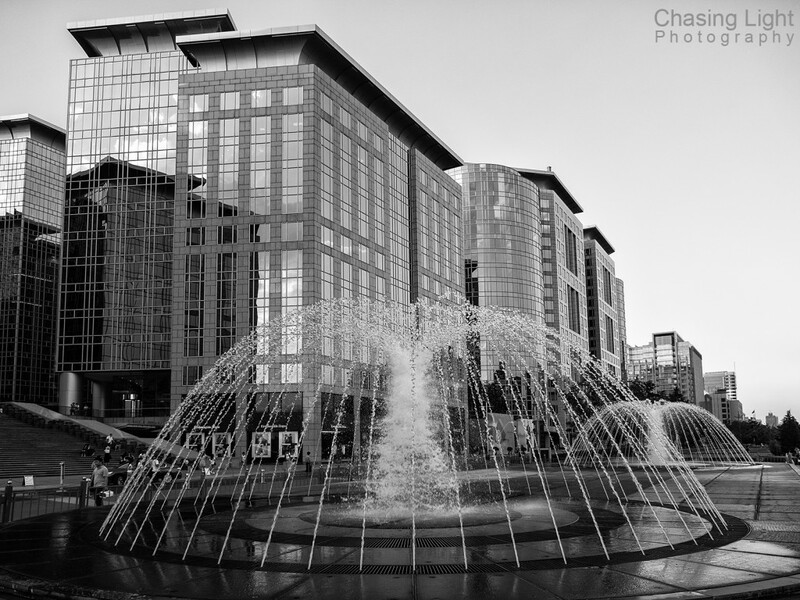 It was taking me 10-20 minutes to create a single HDR image, which is not a very productive use of time. Bill Gates is famously rumored to have said in 1981 that 640K of RAM ought be enough for anyone. I’m here to say that today, 4GB of RAM is not enough. The new computer has 16GB of RAM and it makes all the difference. With the new computer I can create HDR images and do other edits quickly and efficiently. I’ve been wanting to go back through my files and re-edit some of my old images with the new techniques that are now available. The turtle speed of my old computer was holding me back. The image at left is one of the images I wanted to process. It was taken in 2008 with my Nikon D200. One of the pieces of advice that I never followed “in the old days” was to edit ruthlessly and discard images that you know are not useful. The common wisdom said to select the best image from a bracketed series and discard the rest. Boy am I glad I never got around to doing that. Now I can go back through my archives and create HDR images from my travels. 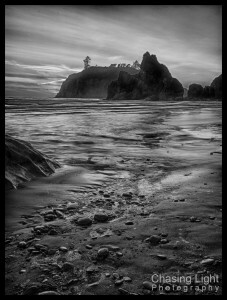 The image above is from the Olympic coastline in Washington. I was never quite happy with the image I got from a single frame. The depth and contrast just didn’t seem to make the image pop. However, now I can add the additional data from the bracketed images and get a better result. If you’re a photographic packrat like me, you might enjoy using modern software on your older images. Give it a try. This entry was posted in Photography, Technology, Tips & Techniques, travel on July 17, 2013 by Michael Weeks. Some places are known for particular wildlife scenes and behaviors. If you want to see polar bears, you go to Churchill, Manitoba, Canada. If you want to see grizzly bears catching salmon, you go to Brooks Falls, Alaska. 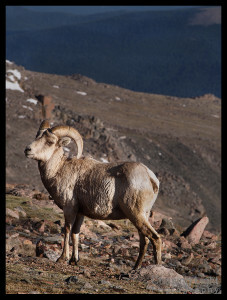 Likewise, if you want to see bighorn sheep and mountain goats, you go to Mt. Evans, Colorado. The access to Mt. Evans is spectacularly easy. It’s one of two fourteeners in Colorado where you can drive right to the top (Pikes Peak is the other drivable fourteener). The road to the summit is the highest paved road in North America. 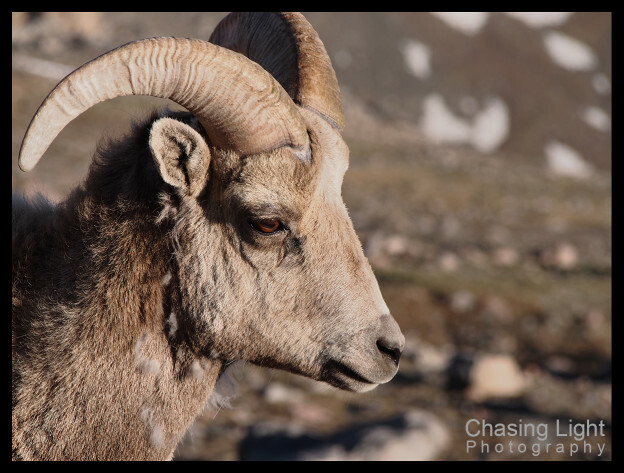 In late June and through July, the bighorn sheep and mountain goats are everywhere. 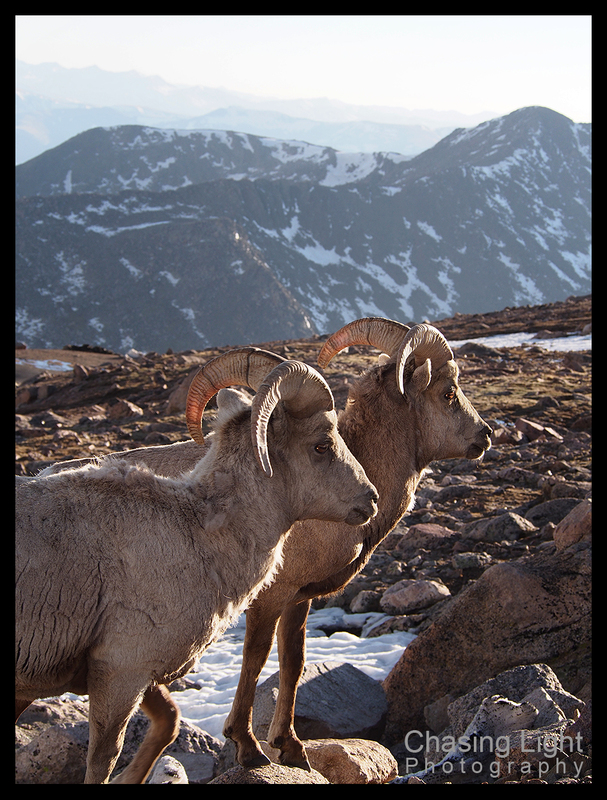 Around the first of July, the mountain goats bring their new kids to the top of the mountain to graze. I expected to see mountain goats on this trip, but I only saw one from the side of the road. Instead, I saw lots of bighorn sheep. The animals are habituated to human presence, so they don’t seem bothered unless you get too close. It’s amazing how close they stay to the road and parking areas. You don’t need a particularly long or heavy lens to get tight shots. This is a place I like to return to again and again. The opportunities for wildlife shots are incredible. For all three of these shots, I used the Olympus OM-D EM-5 camera and the inexpensive Olympus 40-150 zoom. This little lightweight zoom lens is incredibly sharp. It is one of the best bargains for the micro four-thirds system. I highly recommend a drive to Mt Evans if you are in Colorado. It’s about 2-3 hours from Denver to get to the summit. The road to the summit opens every year around the first of June and remains open until September (weather permitting). The National Park fee for the summit is $10, or free if you have an annual National Park access card. This entry was posted in Photography, Tips & Techniques, travel on July 2, 2013 by Michael Weeks. I first saw Hanging Lake about 8 years ago on a family vacation. I took some pictures at the time, but it was mid-day and, while they were fun snapshots, I always wanted to go back. Often, once I find a location I want to shoot, it takes multiple trips to find just the right composition and lighting. Last week I was in Colorado to be a leadership mentor for the Rocky Mountain High program. I took the opportunity to arrive about two days early to do some shooting. 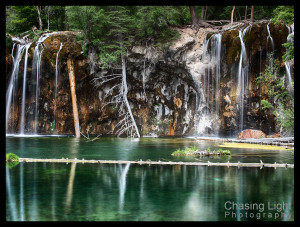 My first stop was Hanging Lake. I arrived in Denver about noon and drove straight to Glenwood Springs (about 3 hours) to the Hanging Lake trailhead. 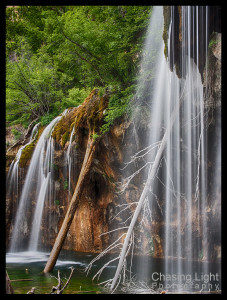 The Hanging Lake trail is only about 1 mile long, but unfortunately, it’s all uphill. The trail gains about 1,000 feet of elevation in that short mile up Glenwood Canyon. Couple that elevation gain with the 8,000 base elevation at the trail head and you have quite a workout — especially when you are arriving from the flatlands of Florida! Thank goodness for my lightweight micro four-thirds gear. The green color of the water comes from the travertine rock formation that forms the lake and the mineral content of the water. The color of the water is just as you see it. I haven’t done any strange Photoshop tricks to modify it. 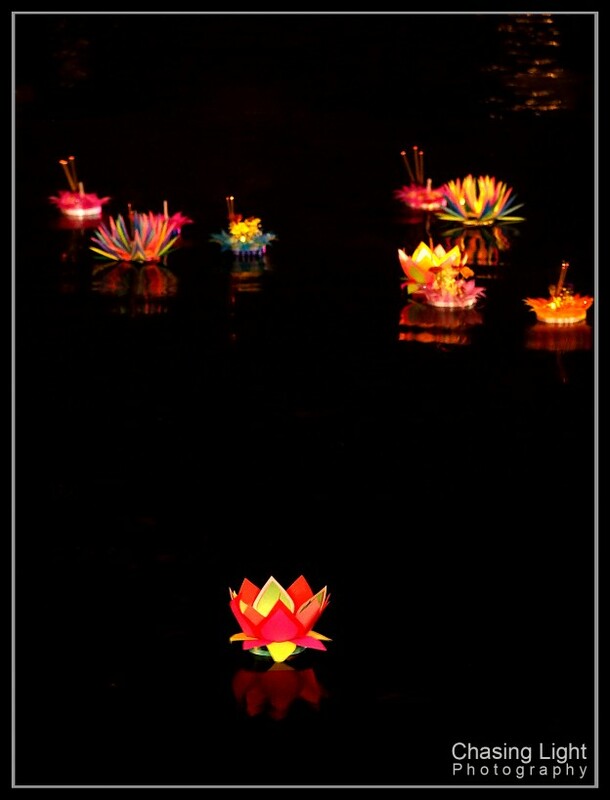 The lake is quite fragile ecologically, so you can’t swim in it or otherwise enter the water. I descended the steep trail before it got too dark and went straight to my hotel. I briefly contemplated going back for sunrise, but since sunrise was at 5:30, I would have had to leave my hotel before 4 AM — a little too early after traveling all day on the previous day. Although this was my second attempt at Hanging Lake and I like the most recent shots better than my first set, I still think that I may have a few trips left in me for this location. I still want to find that magical light at this magical location. This entry was posted in Photography, Tips & Techniques, travel on June 26, 2013 by Michael Weeks. The picture at left is why I love the micro four-thirds format so much. What you see is all I need for a week of backpacking in Colorado. 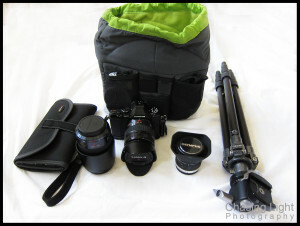 The whole setup probably weighs less than 7 lbs, including tripod. I’m confident that what you see here will allow me to capture everything I want while in the backcountry, and I won’t kill my back lugging heavy equipment. This also gives me room for those little nice-to-have extras like a tent and sleeping bag. I just put all of this stuff in the Crumpler Haven bag and stuff it in my backpack. I strap the tripod to the outside of the pack. I’ll be on the road with limited access for the next week or so, but hopefully I’ll have something to show for it on the blog when I return. This entry was posted in Photography, Tips & Techniques, travel on June 12, 2013 by Michael Weeks. 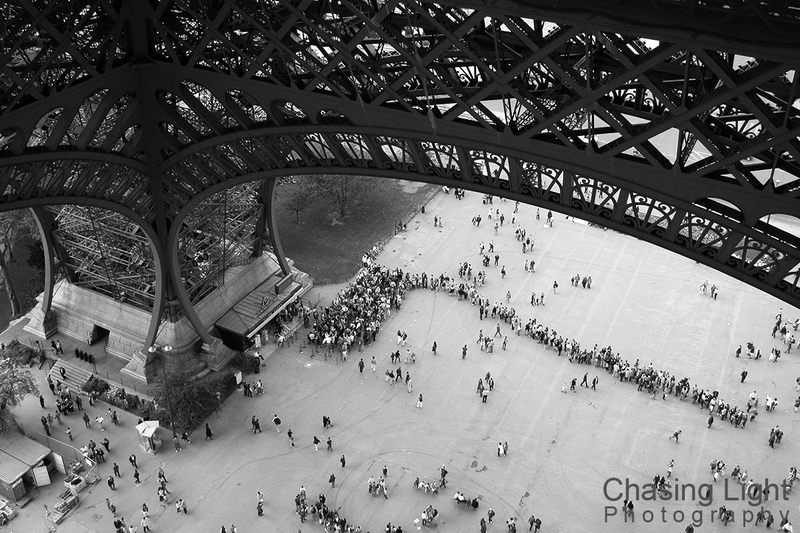 This entry was posted in Photography, travel on May 22, 2013 by Michael Weeks.